You may have heard the phrase that Cricket is a religion in India and Sachin is its god. You can’t deny the above unless you’re someone whose romanticism in life meets the likes of men of the caliber of superstar Shah Rukh Khan or the inconic and evergreen Mr. Amitabh Bachchan. But, this is India my dear. Over here, hero worshipping runs in our veins. Interestingly, at the turn of a century and at times, funnily before, there are sudden ‘face changes’ that happen to our idols. Some faces remain unchanged and some ‘deities’ are newborn. While Sachin, Shah Rukh, Bachchan and A.R. Rehman stay unmoved in the dreamy landscape of Indian sub-consciousness, new idols constantly come about and hold their unique place in our hearts and minds. If you are someone who dreams, thinks, talks and does pretty much everything that’s Cricket in your DNA, then chances are, your constant companion in the hearts of hearts is a special cricketing trinity whose impact in the landscape of Indian cricket is virtually immeasurable and its contribution, really hefty. The Dravid’s, Ganguly’s, Laxman’s are all gone. 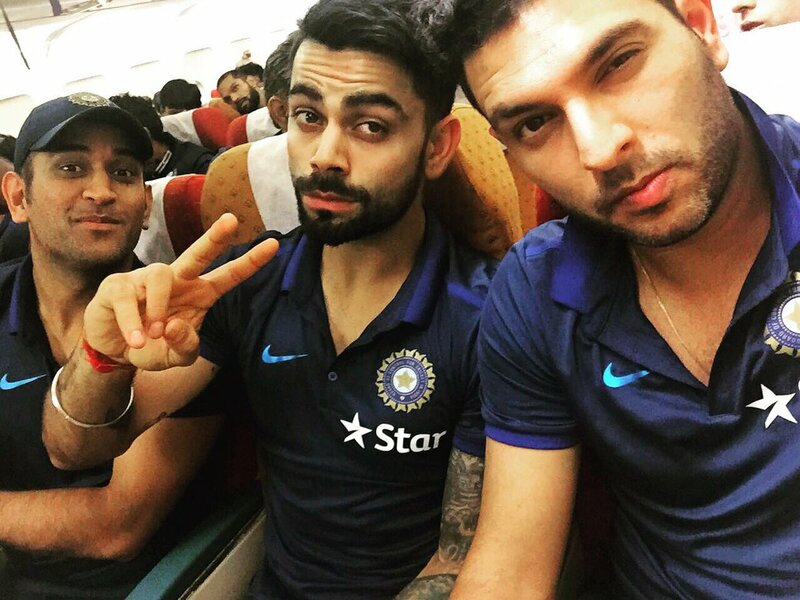 And the holy trinity of Yuvraj, Kohli and Dhoni has taken center-stage. While the 35 year old Yuvi continues to adorn our hearts with his hefty blows and the art of timing and a certain ‘Mahi’ continues to mentally derail opponents with his ‘ice coolness’ and gravitas, India’s healing embrace to the wounds often inflicted by our rivals is a “Virat” power. How often have you seen a low scoring game between two arch rivals of the cricketing galaxy? Probably, not many times. The recent outing between the ‘unpredictable’ Pakistan and the ‘unstoppable’ men in blue at Mirpur was a low scoring event. Batting first, Pakistan stumbled, nearly from head to toe in their painstaking compilation of a mere 83 on board. India, whilst chasing, made heavy work of the paltry ask of Pakistan, losing out Rohit and Dhawan on ducks. In came Kohli and upon seeking support from Yuvraj, changed the tide of the game. The 68 run partnership between Yuvi and Kohli featured 9 collective boundaries. 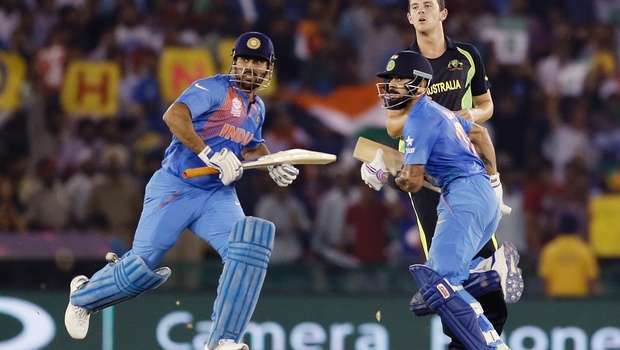 The result: India ran home with a 5 wicket victory with as many overs to spare. West Indies might have been the champions at the highly impressive World T20 event held at the Island paradise of Sri Lanka, but their magnanimity found hefty competition in front of some of India’s memorable matches in the same tournament. Reference to context being the much awaited India versus Pakistan game. Pakistan, who have often struggled in the recent past in compiling mighty scores against their nemesis, India, could make only 128 off 20 overs, batting first on what looked to be a batting friendly wicket at Colombo. The Indian run chase was glamorized by the Kohli-Yuvraj pairing that craftily took India home thanks to a sincere and well compiled 54 run partnership, having lost Dhawan, Raina and Rohit cheaply. Kohli, back in 2012 had crafted his personal best score in the match with a gritty 61 ball 78. Well supported by Yuvraj, who made an important 19 off 16, the duo struck some thunderous blows off both spin and pace and didn’t let Mahi to come out at all. It doesn’t matter which team you are supporting in the World T20 stage, as the odds are often in favor of the home side in the shortest format of the game, according to the Cricket Pundits. Perhaps, India too would have walked into to bowl with this thought in mind whilst facing a mighty looking Aussie side powered by the likes of Khwaja, Finch, Watson, Warner, Faulkner, Smith and Zampa. Little would have the Indians thought that they would be able to contain the Aussies who landed with a ‘safe looking’ 160 having been 55 without a wicket in the first 4 overs. But, then no total is ever safe for Australia if the batsmen in the opposing team are of the class of Kohli, now India’s most successful run chaser and Dhoni, the ever gritty and calm force in the middle. The vital 67 run stand between ace chaser Kohli and Captain Courageous Dhoni powered India to a 6 wicket triumph that eliminated Aussies from reaching the semis, paved way for India in the final stages of the tournament and also broke several records in the process. Kohli, who smoked the dust off Coulter-Nile, Faulkner and co made a charming 82 runs off 51 balls, with 2 sixes and Dhoni who belted 18 off 10 with 3 boundaries including that glorious pull off Watson once again hit the final decisive hit, loosening the coil on Australia’s high hopes. While on one hand Aussies had a full overload of power and attacking cricket punctuated by constant rotating of the strike (the duo took 6 twos between them), on the other, the likes of Faulkner and Coulter-Nile were brutally dealt by Kohli’s vicious timing of the ball. In the end, their first 50 run stand led to a total of 258 runs scored between Dhoni and Virat in their last 10 T20 stands together. In the process, Kohli also bettered his personal best of 78, made against Pakistan in World T20 2012. Nagpur can be a tricky pitch to bat. You can ask Darren Sammy’s West Indies who succumbed to a surprising 6 run loss to Afghanistan recently. Back then in 2012-13, this was still a tough wicket to compile huge scores even at a test level. India facing England in the all important home series of the Pataudi trophy were lifted by a special Virat and Mahi show once again. 4 years back, the duo starred in the English bashing of a record 198 run partnership for the 5th wicket in the 4th Test. Kohli, smashing 103 alongside Dhoni, with a thrilling 99, together trampled over England with 19 boundaries and 1 six between them. The result: India paraded to a comfortable draw. The recently concluded India versus Pakistan duo at the garden of Eden and Glory; Eden Gardens at Kolkata was memorable for many reasons. India, derailed Pakistan’s hopes of running over them. Afridi, the much loved and often ‘chided’ Pakistani icon was once again at the midst of a storm, given his poor showing with the bat. And finally, Virat Kohli, rose to the epicenter of an epic clash, orchestrated by Big B (Mr. Bachchan’s) singing of the National Anthem, the god almighty Tendulkar’s presence in the stands and amidst a million plus voices raging for an Indian triumph. Chasing a mere 119 in a run affected game, India scampered home thanks to Kohli’s brilliant 37 ball 55 and Dhoni’s important 13 off 9, but not before stopping a few hearts with the cheap albeit cheeky dismissals of Raina, Dhawan and Rohit. Importantly, Yuvraj, chipped in with a vital 24 off 23 balls at a time when wickets were stumbling. South Africa aren’t mediocre by any standard of imagination, never-mind their constantly choking abilities in the middle that reduce their stay in a competition. They are an opposition you take lightly only if you believe in oblivion or fantasy. Last year , amidst Cricket’s grooviest carnival, the ICC World Cup 2015, Shikhar Dhawan and Virat Kohli powered India to a meaningful triumph over the mighty Proteas thanks to a 127 run second wicket stand ,in a game that had much on stake: Captain Dhoni’s form, India’s recent record against South Africa and charming opener Dhawan’s own form. Compiling a mighty 307 run score, Shikhar climbed the mental demons of his mind in his audacious 137 off just 146 balls. Well supported by Virat Kohli, our top cat at No.3, who plundered an important 46 off 60, Dhawan powered knock became too much for South Africa who were put on the backfoot thanks to great tight bowling and all round sharp fielding, making only a lousy 177 despite having du Plessis, de Kock and De Villiers in the side. 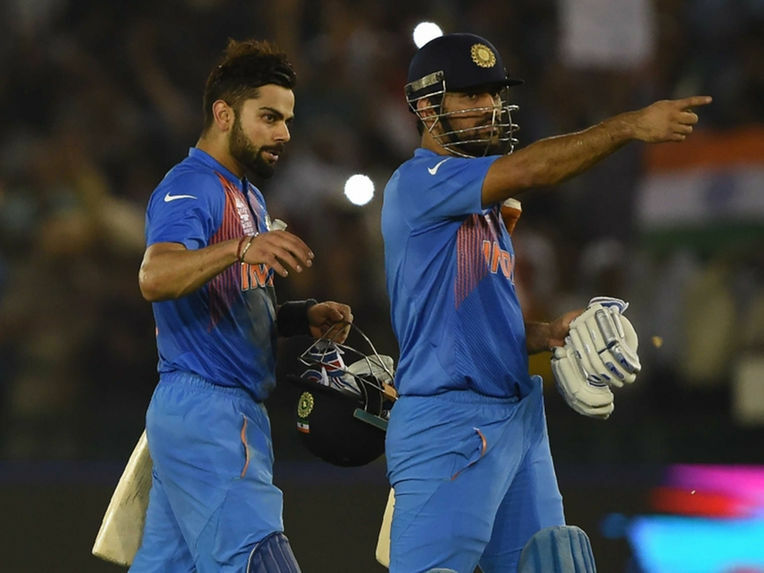 India have often taken the mickey out of Pakistan in high octane games at the highest level. During last year’s World Cup, India were once again the dominant force thumping Pakistan by a hefty 74 run victory in an important league game at Australia. Scoring around 300, India’s stars of the day were gritty batting opener Shikhar Dhawan and batting ace at no.3, Virat Kohli, who compiled a match winning 110 run stand powered by 15 boundaries and a solitary six. Kohli who made an important century in the game peaked to form with 107 off 126 balls with 8 boundaries. He had able support of an in-form who made an impressive and fluent 73 off 76 consolidating India’s position in the high octane batting dominated game. 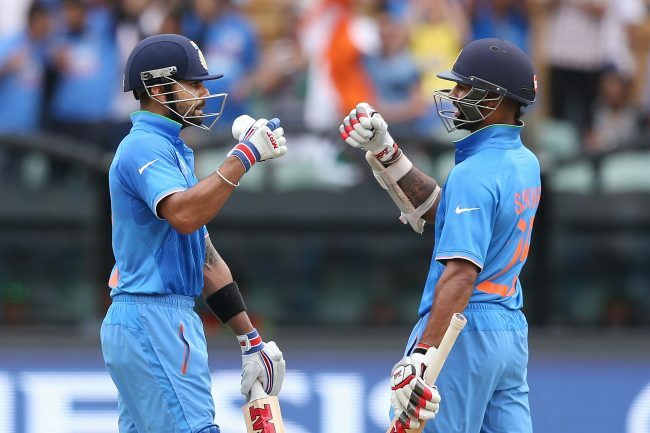 The result: Kohli and Dhawan’s impressive partnership proved too much for Pakistan to handle who crumpled at 224. In the record books of Indian Cricket, Virat Kohli’s name shall be mentioned in gold given his determination to produce important knocks time and again for India’s victory. At the same time, it cannot be ignored that India’s daring and guile over its opponents had the master class of batsmen of very precious quality and of the class of the graceful Shikhar Dhawan, the left handed stylist Yuvraj Singh and the man who can keep his cool even when walking on fire: MS Dhoni. Take a bow Men in Blue.